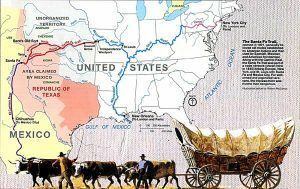 Between 1821 and 1880, the Santa Fe Trail was primarily a commercial highway connecting Missouri and Santa Fe, New Mexico. From 1821 until 1846, it was an international commercial highway used by Mexican and American traders. In 1846, the Mexican-American War began. 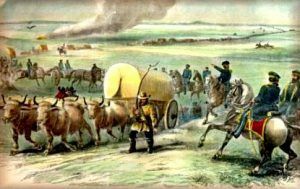 The Army of the West followed the Santa Fe Trail to invade New Mexico. When the Treaty of Guadalupe Hidalgo ended the war in 1848, the Santa Fe Trail became a national road connecting the United States to the new southwest territories. Commercial freighting along the trail continued, including considerable military freight hauling to supply the southwestern forts. The trail was also used by stagecoach lines, thousands of gold seekers heading to the California and Colorado gold fields, adventurers, fur trappers, and emigrants. In 1880 the railroad reached Santa Fe and the trail faded into history. The Santa Fe Trail stirs imaginations as few other historic trails can. For 60 years, the trail was one thread in a web of international trade routes. It influenced economies as far away as New York and London. Spanning 900 miles of the Great Plains between the United States (Missouri) and Mexico (Santa Fe), it brought together a cultural mosaic of individuals who cooperated and sometimes clashed. In the process, the rich and varied cultures of Plains Indian people were caught in the middle and changed forever. Spain jealously protected the borders of its New Mexico colony, prohibiting manufacturing and international trade. Missourians and others visiting Santa Fe told of an isolated provincial capital starved for manufactured goods and supplies, a potential gateway to Mexico’s interior markets. In 1821, the Mexican people revolted against Spanish rule. With independence, they unlocked the gates of trade, using the Santa Fe Trail as the key. Encouraged by Mexican officials, the Santa Fe trade boomed, strengthening and linking the economies of Missouri and Mexico’s northern provinces. Soldiers used the trail during 1840s disputes between the Republic of Texas and Mexico, the 1846-48 Mexican-American War, and the Civil War, and troops policed conflicts between traders and Indian tribes. With the traders and military freighters tramped a curious company of gold-seekers, emigrants, adventurers, mountain men, hunters, American Indians, guides, packers, translators, reporters, and more. The close of the Civil War in 1865 released America’s industrial energies, and the railroad pushed westward, gradually shortening and then replacing the Santa Fe Trail. Movies and books often romanticize Santa Fe Trail treks as sagas of constant peril, replete with violent prairie storms, fights with Indians, and thundering buffalo herds. In fact, a glimpse of bison, elk, pronghorn antelope, or prairie dogs was sometimes the only break in the tedium of 8-week journeys. Trail travelers mostly experienced dust, mud, gnats and mosquitoes, and heat. But, occasional swollen streams, wildfires, hailstorms, strong winds, or blizzards could imperil wagon trains. At dawn, trail hands scrambled in noise and confusion to round up, sort, and hitch up the animals. The wagons headed out, the air ringing with whoops and cries of “All’s set!” and soon, “Catch up! Catch up!” and “Stretch out!” Stopping at mid-morning, crews unhitched and grazed the teams, hauled water, gathered wood or buffalo chips for fuel, and cooked and ate the day’s main meal from a monotonous daily ration of one pound of flour, one pound or so of bacon, one ounce of coffee, two ounces of sugar, and a pinch of salt. Beans, dried apples, or bison or other game were occasional treats. Crews then repaired their wagons, yokes, and harnesses, greased wagon wheels, doctored animals, and hunted. They moved on soon after noon, fording streams before the night’s stop because overnight storms could turn trickling creeks into torrents. Livestock that was cold in the harness first thing in the morning tended to be unruly. At day’s end, crews took care of the animals, made necessary repairs, chose night guards, and enjoyed a few hours of well-earned leisure and sleep. Deceptively empty of human presence as the prairie landscape might appear, the lands the trail passed through were the long-held homelands of many American Indian people. Here were the hunting grounds of the Comanche, the Kiowa, southern bands of the Cheyenne and the Arapaho, and the Plains Apache, as well as the homelands of the Osage, the Kanza (Kaw), the Jicarilla Apache, the Ute, and the Pueblo Indians. Most early encounters were peaceful negotiations centering on access to tribal lands and trade in horses, mules, and other items that Indians, Mexicans, and Americans coveted. As trail traffic increased, so did confrontations – resulting from misunderstandings and conflicting values that disrupted traditional lifeways of American Indians and trail traffic. 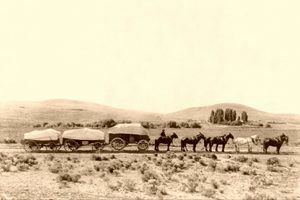 Mexican and American troops provided escorts for wagon trains. Growing numbers of trail travelers and settlers moved west, bringing the railroad with them. As lands were parceled out and the bison were hunted nearly to extinction, Indian people were pushed aside or assigned to reservations.